Are you stuck in the “I’ll fix it when it breaks” PC maintenance and help desk cycle? 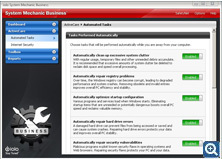 With our patented ActiveCare® technology, System Mechanic Business can fully automate over 50 maintenance tasks, so you finally move into a proactive and preventative IT Support model. 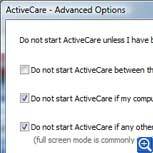 Idle-time processing – Only ActiveCare’s patented technology can truly detect when your PC isn’t being used, so it never interrupts you while you’re working or playing. It even stays out of your way when you’re watching movies or listening to music! ZeroRAM™ technology – ActiveCare is designed to virtually disappear from memory when it is not running, thereby never impacting your system performance by having it turned on. Efficient Operation – ActiveCare only performs repairs and optimizations are specifically needed by the PC at the time it runs. It never wastes time “going through the motions” like ordinary schedulers that can spend hours performing operations that aren’t even required, simply because they were scheduled. Additional configurations allow you to fully customize when ActiveCare runs – you can control ActiveCare processing based on scheduled times, battery power usage, CPU usage, full screen mode for gaming/videos and more. Web-based ActiveCare reports summarize your PC’s status over a specific time period. You can see what optimizations and repairs System Mechanic has performed and track changes to your PC’s health and security. This is particularly handy for the “family PC guru” or system administrator to keep up-to-date on the status of all the PCs you manage. TIP: Use the new PC Health Status Gadget for Windows 7 and Vista to get instant readings of critical PC Health and system status right on your desktop.